WE don’t have to rely on ministerial expense scandals, corruption in high places and lying politicians to convince us that parliamentary democracy is a sham; the system itself is rotten to the core. In the past, the political process involved small groups of chieftains, warriors and holy men, each of whom would get together at regular intervals to discuss the needs and aspirations of their respective communities; particularly in relation to security and wellbeing. Politics has always been open to abuse, of course, but the Anglo-Saxon (Germanic) tradition of the Witenagemot – also known as the Witan – was one of the more decentralised examples of how our ancestors would exert a form of political authority that had been channelled up from the grassroots. Those involved felt a sense of duty and responsibility to their people, quite unlike the politicians of today with their noses firmly stuck in the trough. The main problem with parliamentary democracy is the fact that it is representative. Indeed, whilst it is possible for people to vote for a political party and elect a politician from their immediate locality, that individual cannot be recalled or replaced for several years – depending on the country concerned and the parliamentary system in question. However, as we know only too well, politicians are not very good at keeping their promises and tend to get elected and then make a series of treacherous u-turns. So whilst a politician claims to represent your interests he or she actually represents the interests of a party. The term ‘party’ relates to a part of the whole, so despite a Member of Parliament supposedly representing people residing within a specific area, only a mere section of the community – i.e. those who voted for the MP in the first place – is able to have its wishes expressed. And that’s without taking into account that a minority of people even bother to vote in the first place, let alone the fact that politicians rarely bother to fulfil their promises! Instead of representative democracy, through which politicians serve their own interests at the expense of the community on behalf of the state, National-Anarchists believe in participation. In other words, instead of voting for politicians every few years and then allowing them to go on and act precisely as they wish, we believe that people should take an active role in politics themselves. Not on a national scale, but within their own localities. Instead of politicians, National-Anarchists favour delegates, people who must either reflect the wishes of the people or be replaced immediately. This process would safeguard against corruption and unaccountability and make sure that people had a real say in the running of their own areas. This will mark a return, if you like, to the old Witenagemot system. And whilst National-Anarchists do not believe in applying centralised ‘rule’ we do accept that the actual form of decision-making is something that will be particular to each community. And community is the key word. Despite the fact that early Anarchism had so much to offer those living beneath the heel of the old European monarchies and, consequently, the new capitalist class that emerged from the Reformation and Enlightenment, the growth of the Left soon led to Anarchism being completely infiltrated. The groups that direct the anti-capitalist ‘movement’ are usually led by Left-wing dogmatists and control-freaks who like to claim that National-Anarchists are trying to subvert Anarchism for their own ends. But this is false. As we have said elsewhere, time and time again, we are not ‘racists’ or ’white supremacists’ with some kind of secret agenda, we have formulated a programme to combat the continuing degeneration of Western society and ensure that things like diversity, identity and cultural heritage survive the impending collapse. Sadly, however, most people on the Left will not rest until they can organise every minute aspect of people’s lives. It is a self-perpetuating disease. This is why Leftists talk of the ‘right to work’, when – as Bob Black rightly points out – the real problem is work itself. The Left, just like the totalitarian Right, refuses to tolerate anyone who tries to opt out of its vision of an all-inclusive society. Some of us, however, want no part of this and will only ever be ‘socialists’ among ourselves and with our own kind. In this respect, we are an elitist Movement holding firm to the notion of meritocracy. What we do not accept, however, is that everybody is ‘equal’. The issue of egalitarianism is one of the main stumbling blocks of the contemporary Left and stems from John Locke’s ill-conceived theories about the tabula rasa. This is the ludicrous idea that humans enter the world as a ‘blank slate’ and soak up everything around them like a sponge. But we are not merely influenced by environmental factors or the impression made upon us by our immediate surroundings, we also inherit many genetic traits from our parents, grandparents and great-grandparents. To some extent, then, we have already been shaped before we even leave the womb and that can have a big impact on the kind of people we eventually become. The socio-economic climate in which someone is born can have an impact on the way they develop, of course, but genetic factors far outweigh the environmental considerations and should not be ignored. To suppose, therefore, that humans are somehow ‘equal’ is quite ridiculous. On the other hand, this does not mean that people who are less intelligent or physically handicapped should be treated with disdain or cruelty. Those who display a superior ability in certain areas have a responsibility to those who exhibit less. Humanity – like the rest of nature – is hierarchical and the Left’s progressive fantasies about a world in which everyone acquires the same rank, inevitably manifests itself as a levelling process in which oppressive laws are used to drag the strong down to the level of the most weak and resentful. National-Anarchists believe in encouraging people to express their full potential, not in forcing them to sink to a common denominator. Left-wing politics inevitably descend into barbarity and totalitarianism and this is why capitalism has been allowed to prosper to the extent that it has. Whenever the Left ascends to power, it simply administers capitalism in a slightly modified form; through the bureaucratic organs of the state. Left-wing strategy, however, has often been highly effective and there is no reason why tactics such as entryism, industrial sabotage, picket lines, fundraising and community action should not be used by National-Anarchists. This is why we have also recommended several texts dealing with Derek Hatton’s Militant and other organisations that have successfully infiltrated both local councils and the ranks of their opponents. To conclude, National-Anarchists reject both state and private capitalism and wish to ensure that power begins at the grassroots and is channelled upwards. This vision is a long way from the dehumanisation of the Left-wing ‘workers state’, in which people are portrayed, not as individuals, but as economic units ripe for exploitation. Make no mistake, the Left does not offer an alternative of any kind and should be rejected. IN the eyes of many people, the word ‘Anarchism’ conjures up lurid images of a scowling Johnny Rotten waxing lyrical about unleashing chaos and destruction upon contemporary society. Anarchists are supposed to be anything from long-haired nihilists and hedonistic drug fiends to happy-clappy utopians completely out of touch with the real world. The nineteenth-century representation of the average Anarchist, at least according to those who set out to lampoon or vilify it in the controlled media, was that of a stereotypical madman, invariably bearded or bedraggled, clutching a bomb or stick of explosive. But real Anarchism has nothing to do with decay and degeneration, or with mindless violence and terror, it can actually provide a real and tangible alternative to the ongoing decline of Western civilisation. Anarchy originates from the Greek term an archos, meaning ‘no rule’ or ‘without rule’. This should not imply, however, that Anarchists believe in disorder, because in this case the term ‘rule’ is associated with the manner in which a society is organised in accordance with a specific form of behaviour or conduct. So to suggest that a community should have ‘no rule’, therefore, does not mean that it should descend into utter chaos, because the rule itself relates to an appreciation of the natural order and refuses to acknowledge the constitutional, man-made laws or customs laid down by empires, states and other forms of administrative or governmental control. But this does not mean that Anarchist communities are incapable of adhering to a set of beliefs, values or principles, on the contrary, it simply means that natural order takes precedence at all times. Indeed, natural order is the most organic form of social organisation on the planet, because it allows man to live in the way that nature itself intended. Not as wild animals or in blind ignorance, because man finds himself in possession of a superior intelligence, but certainly as far as satisfying our most basic needs, instincts and desires are concerned. Laws and systems seek to enslave us, but within a more natural and conducive setting we can fulfil our true destinies and rediscover that long-forgotten bond with the environment. 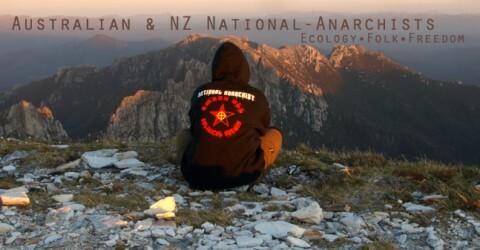 Instead of labouring beneath a system in which ‘rule’ is forcibly imposed, National-Anarchists believe in natural authority. Hierarchy is a basic fact of nature, but something which is quite different to the artificial class system that can be found throughout contemporary Western societies. Leadership, for example, should be encouraged, but it also comes with responsibility and within an Anarchist or tribal context the chief or alpha male is only as strong as the community. In the words of Rudyard Kipling, ‘the strength of the pack is the wolf and the strength of the wolf is the pack’. Unlike the huge gulf between those who govern and those who are governed today, the two are inseparable and necessarily complimentary. When Marx and Engels published their Communist Manifesto in 1848, the workers and peasants of Europe believed that they had at last found an answer to the greed and ruthlessness of capitalism. But Marx was advocating a crude form of totalitarianism which he called ‘the dictatorship of the proletariat’, something which merely led to the creation of a new ruling class and, thus, the perpetuation of mass wage-slavery. But the communists were not the only ‘opponents’ of capitalism, around the same time a Frenchman by the name of Pierre-Joseph Proudhon had launched an attack on both capitalism and communism, firmly believing that the latter undermined human individuality. Consequently, several Russian Anarchists, among them Mikhail Bakunin and Peter Kropotkin, also tried to expose the futility of Marxism and, instead, wrote of a future decentralised world of collectives in which people could have more autonomy and express their own identity. During the twentieth century, however, the ranks of Anarchism were infiltrated by communists and what began as a noble ideal characterised by a belief in freedom and identity degenerated into Left-wing bureaucracy and the kind of political correctness that we are so familiar with today. There is no question that the Left has dragged the proud banners of Anarchy through the mud and that Anarchism’s image has been severely tainted as a result, but this is precisely why the world is now ready for a brand new ideal: National-Anarchism. But what distinguishes National-Anarchism from the wider Anarchist phenomenon and what does it have to offer? Finally, contrary to the increasingly desperate smears of our enemies on both the Right and Left of the political spectrum, we are not using Anarchism as a convenient tactic or to conceal a secret fascistic agenda of any kind – we are deadly serious. In addition, as mutualists we abide by the ‘live and let live’ philosophy. People are different and have different values. In modern, pluralistic societies, those values tend to conflict and it is inevitable that some values will override or perhaps even eradicate others. We think certain values are worth preserving for future generations and this is why we wish to create a climate in which this is possible. National-Anarchism, therefore, is Anarchism sui generis. An Anarchy of its own kind. ALTHOUGH people around the world are quite aware of the disproportionate influence of Jewish pressure groups within the various governmental and mass media appendages of Europe and North America, most of which are completely under their control, few are prepared to come out and say so for fear of persecution or incurring the usual threats of ‘anti-Semitism’. It is a fact, however, that ever since ambitious European monarchs first plunged us into the financial vortex of the burgeoning international debt system, an elite coterie of Jews and their allies have effectively manipulated world events for their own interests. This was achieved, not simply through usury, but also as a result of Jewish involvement in the bootlegging and criminal racketeering of 1930s America, something which eventually went on to finance the Zionist takeover of the Hollywood film industry and, by 1948, brought about the establishment of the bandit-state of Israel. But Zionism is not Jewish nationalism, as some like to claim, it is Jewish imperialism. National-Anarchists do not ‘hate’ ordinary Jews and neither do we wish to undermine them as a people with their own unique religious and cultural identity, but what we will not tolerate, however, is the ongoing enslavement of our people by a minority of vampiric parasites intent on carving up the world’s resources in an attempt to create a single, global market. We believe that the way to combat Zionism is to continue to expose the hypocrisy of those who, on the one hand, use the Nazi ‘holocaust’ to evoke sympathy, and, on the other, brutally repress the long-suffering Palestinians in their own land. Over 90% of modern Jews are descended from a semi-Turkic people who, faced with the sectarian intolerance of their encroaching Christian Orthodox and Muslim neighbours, converted to Judaism en masse when they were part of the old Khazar empire that spanned the area between the Black and Caspian seas during the eighth century. Indeed, they have no authentic racial or territorial connection with the Middle East at all. National-Anarchists support the Palestinian intifada, as well as Jewish groups like Neturai Karta and various other opponents of Zionism who are seeking to expose the multifarious lies and distortions perpetuated by the Israeli regime, as well as its intelligence wing, Mossad, and the organisational nerve centre which continues to operate at the very heart of the United States Government. Zionism is an enemy of all peoples and must be vanquished. Victor Ostrovsky & Claire Hoy, By Way of Deception: The Making and Unmaking of a Mossad Officer, St. Martin’s Press, 1990. By the time the Middle Ages came along, imperialistic adventurers like Edward I and other monarchical warmongers across Europe were borrowing huge amounts of money from Jewish financiers and plunging the country into mounting debt. But whilst Edward himself found a convenient excuse to deport these usurious individuals from England’s shores, thus saving himself from almost certain bankruptcy, by the sixteenth century events were changing dramatically as the Protestant Reformation swept away the existing socio-economic infrastructure and inevitably caused thousands of people to be expelled from the monastic hospitals, religious almshouses and other places of refuge which, at that time, were maintained by the Catholic Church. According to the radical social commentator, William Cobbett, prior to the Reformation the word ‘poverty’ had not entered the English language. Along with the great religious changes of the sixteenth century, came the artistic flowering of the Renaissance and the less positive values of the humanist Enlightenment. Whilst Christianity had served as the prevailing current in England for many hundreds of years, the new ideas sweeping into England from the rest of Europe now positioned man firmly at the centre of the universe and therefore it was inevitable that spirituality – let alone Christianity – would rapidly decline and be replaced by the materialistic values of a new mercantile order. These profound changes, which led, in England, to the seventeenth-century Civil War and the triumph of Cromwell’s parliamentarians over the monarchy of Charles I, soon paved the way for the French Revolution. Meanwhile, back in the British Isles, an explosion of scientific technology allowed a combination of aristocrats and nouveau-riche to harness the indomitable force that led to the Industrial Revolution. This resulted in the displacement of the country’s rural communities, as millions of people left the land and moved to the expanding cities to work in the soulless mills and factories. This strategy of mass enslavement saw people forced down mines and up chimneys to make profits for the fatcats at the helm. By the first quarter of the nineteenth century, the gap between rich and poor had widened considerably and, if you found yourself at the wrong end of the class spectrum, you inevitably ended up in the workhouse. The capitalist disease had spread across Britain, and the world, like a cancer. Throughout this period, wealthy banking families like the Rothschilds and others were able to seize control of the purse-strings of various European countries, as well as to foment wars and revolutions for their own ends. Various protest movements attempted to fight for justice and better conditions, but in 1917 the communists took power in Moscow and were hailed as a powerful ‘alternative’ to capitalism, despite going on to murder and repress hundreds of millions of people in both Russia, Eastern Europe and the Far East. The reality, of course, is that whilst capitalism exploited ordinary people for private gain, communism was simply a form of state-capitalism administered by a new ruling class. To make matters worse, communism provided the capitalists, as well as the national-capitalists of Nazi Germany and Fascist Italy, with a new impetus and thus smoothed the way for the victory of liberal-democracy and the economic trading bloc known as the West. The rest, as they say, is history. John Burnett, Useful Toil: Autobiographies of Working People from the 1820’s to the 1920’s, Routledge, 1994.